We’ve booked our tickets… This year’s edition of Amberif promises to be the best ever, with over 400 firms expected to attend, as well as innumerable international visitors.Lecture, design competitions, new amber jewlery lines exhibited for the first time. I’ll be blogging about all the buzz over the next two weeks as well as posting new articles to our Amber Reading Room proper as time allows. The Twelfth International Fair of Amber, Jewelery & Gemstones has one very special guest, a mascot, actually. They are the smallest cetaceans in the world. There are six species of them. They live in offshore zones of the seas & oceans. And they are dying at an alarming rate. Our own porpoise, once also affectionately known as the sea pig, the morswin or morsun, is the only cetacean to choose the Baltic as its home. Once numbering thousands, there are now only a few hundred left. When swimming, the Baltic harbor porpoise, which is very similar to the dolphin, usually surfaces for only 1-2 seconds. To catch a glimpse of it is practically a miracle. It’s a living jewel of our sea’s wildlife. The beauty of its body & the style with which it swims are breathtaking. 2005 is the tenth anniversary of Poland’s signing of the European agreement on its preservation -The Agreement on the Conservation of Small Cetaceans of the Baltic and North Seas (ASCOBANS). 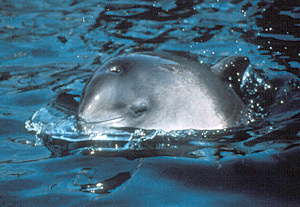 This is why the figure of the Baltic harbor porpoise will be the symbol of the Amberif 2005 Fair. This will help to draw our attention, as people who draw from the riches of the sea, to the fate of this endangered species: the “Baltic Dolphin,” the jewel of Neptune’s treasure chest. These animals were common in the Baltic sea until the 1940s. Since that time, the widespread use of gill nets, which are impossible for them to detect using sonar, increases in maritime traffic, power-boat tourism & low-frequency military echo ranging have all played a roll in the decline of the Harbor porpoise, as has chemical pollution- namely, heavy metals & PCBs. ASCOBANS seeks to help the porpoises by demanding changes in fishing equipment, aggressively cleaning up the waters they inhabit & taking other measures to protect the species. Each year, on the third Saturday of May “International Baltic Harbor Porpoise Day” is celebrated with the aim of raising public awareness of the critical condition of these mammals & their habitat. The proceeds from the charity sales & auctions dedicated to the Baltic harbor porpoise at this year’s Amberif Fair will be transferred to the bank account of the Scientific Plan for the Conservation of the Harbor Porpoise of the Marine Station at the University of Gdansk. “Our institution has been dealing with Baltic mammals for years; we are developing our research program, and our preservation & educational efforts. We plan to build a ‘Morswinarium,” a center for the research, breeding, rehabilitation & preservation of the Baltic harbor porpoise, and the ‘Blue Village,”- a pro-environmental, maritime educational complex” adds Dr. Skora.